Trump To Alaska: You've Been Hit Hard By The Big One - Joe.My.God. 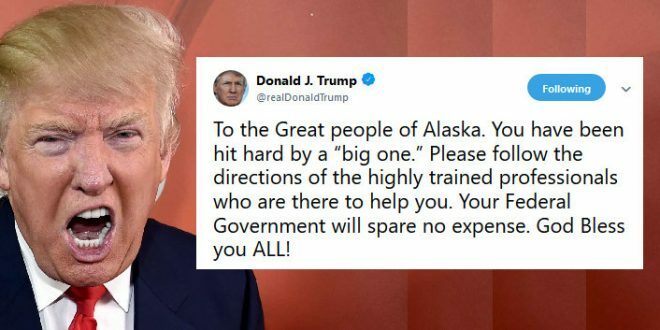 President Donald Trump expressed his support for Alaskans affected by an earthquake on Friday, telling them to listen to emergency response personnel and calling the earthquake a “big one.” Trump has a history of comments after natural disasters that many have characterized as tone deaf or just plain weird. After Hurricane Maria, Trump and San Juan Mayor Carmen Yulín Cruz engaged in a feud over the sluggish federal response and a number of comments from the president downplaying the damage from the storm. Less than five minutes after his tweet supporting Alaskans affected by the earthquake, Trump shifted gears tweeting praise of a new iteration of NAFTA signed in Buenos Aires today. Great reviews on the USMCA – sooo much better than NAFTA!